The outer layer of our bodies, the skin and intestine, contains a special population of white blood cells, called intraepithelial lymphocytes. It is largely unknown how the activity of these cells is controlled, not fully activated nor at rest. Using imaging and biochemical experiments, the research group led by Marc Veldhoen has now shown this is, at least in part, due to differences in the cells' "batteries" – the mitochondria. These energy-producing structures are present inside our cells regulate the cell's power. 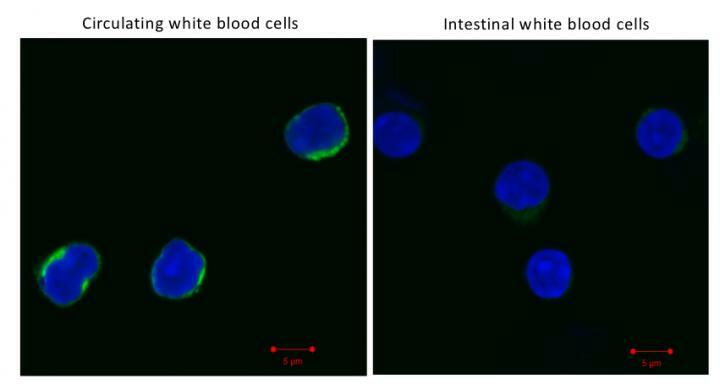 "We hypothesised that these gut-resident white blood cells may use energy in a different way. It was surprising to see that the detection of mitochondria gave a very different picture than seen in other white blood cells, forming the basis of a new hypothesis that the mitochondria themselves are different in these cells", explains Marc Veldhoen. *Konjar, S., Frising, U.C., Ferreira, C., Hinterleitner, R., Mayassi, T., Zhang, Q., Blankenhaus, B., Haberman, N., Loo, Y., Guedes, J., Baptista, M., Innocentin, S., Stange, J., Strathdee, D., Jabri, B., Veldhoen, M. (2018) Mitochondria maintain controlled activation state of epithelial-resident T lymphocytes. Sci. Immunol. 3, eaan2543. doi – 10.1126/sciimmunol.aan2543.